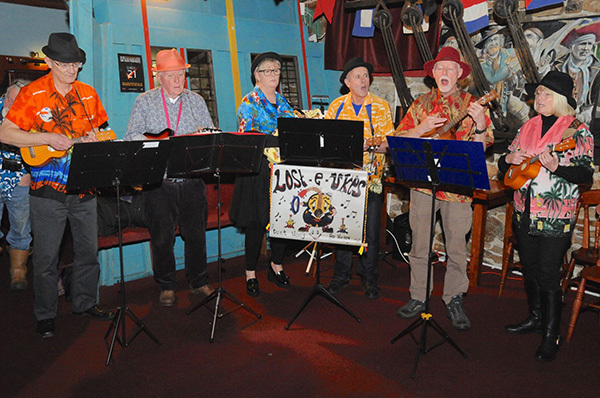 Losty Ukes was formed in March 2014 as a beginners ukulele group. 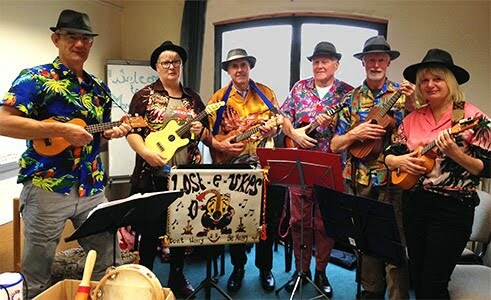 Most of us started from scratch, with no experience of playing a ukulele. Now, after many enjoyable sessions spent learning songs and techniques, we have a pretty large repertoire of material to perform. 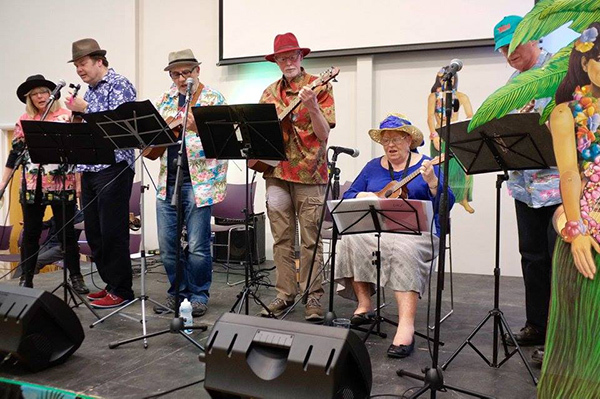 In addition to our weekly meetings, we also perform regularly in public for various non-profit organisations and charities. We meet weekly on Tuesday afternoons, plus some additional evening/daytime ad hoc sessions. We enjoy performing at various festivals, plus other charity and non-profit events. If you would like to book us for an event, then feel free to contact us, details above. Would you like to join our band? Can you sing? Can you play Ukulele? Do you enjoy performing? If yes, then read on . . . 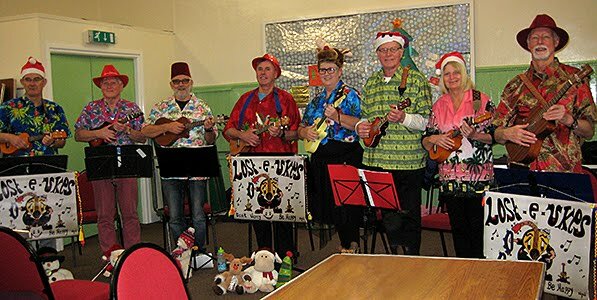 There are many beginner ukulele groups around that are open to all abilities, but we are not one of those. We are an intermediate level group who get together to sing, play, and to advance our skills. We also enjoy performing in public as a band. At this moment in time, we are seeking . . . Play 20 or more chords smoothly and confidently. Apply various different strumming patterns and rhythms to suit individual songs. Play in time with others in a live band situation. Learn new songs quickly, and in particular learn our current repertoire of songs. Sing in tune and project their voice at a level that can be heard by the audience in a live situation (without using a PA). Play ukulele at "improver" level or above. Play and sing in time with others in a live band situation. Attend our meetings and rehearsals on a regular basis. Practice regularly in their own time in order to learn our material and advance their skills. Commit to attend and perform at our public performances. So, if you are interested in joining us, then please feel free to contact us by email or telephone to arrange to come along and meet us. We are a very friendly group who would welcome some additional skilled players and/or singers. 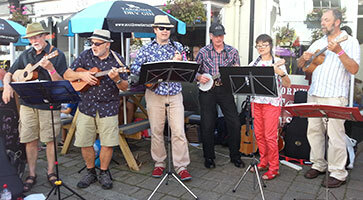 Click here to see the Wadebridge photos. 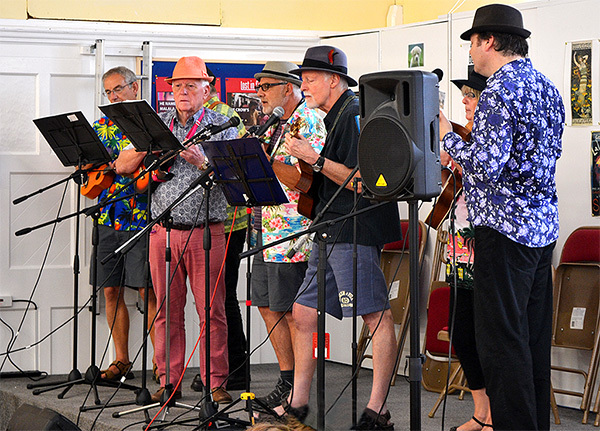 Our Ukulele Fun Day was a great success, drawing bands and players from all across the West Country. There was the chance to see a wide range of bands performing, opportunities for individual open mic performances, plus a grand jam session with songs for everyone to join in. Some very tasty food and drink was served up by the volunteer ladies from Cancer Research UK, and by the end of the day, a grand total of £423 had been raised for the charity from sales and donations. Click here to see the Fun Day photos. Many thanks to our photographer, Glyn Wise. What a great day this was. 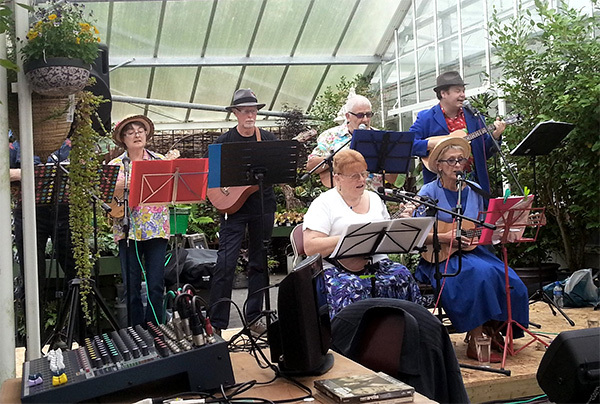 A wonderful event organised by The Dancing Flea Orchestra from Penzance. 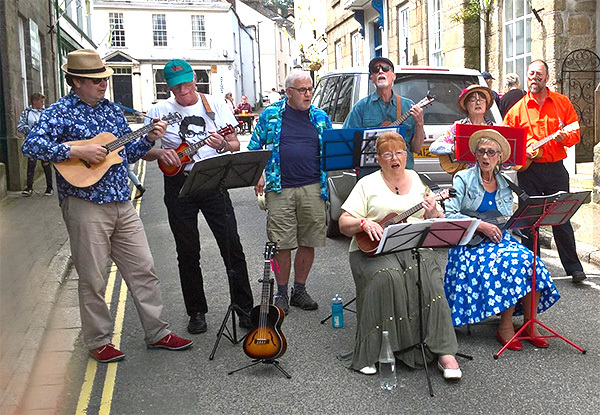 We performed a set of songs, along with another six ukulele bands from Cornwall. The finale was a fantastic evening concert by ukulele maestro Phil Doleman. 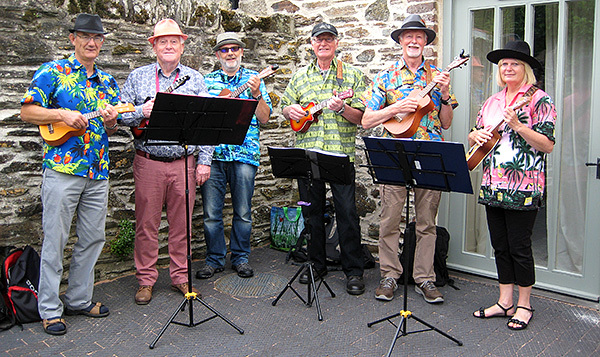 We will of course be hosting our own Ukulele Fun Day in Lostwithiel in September.